This area around Schloss Hugenpoet once belonged in the manorial domain of Charlemagne in 778. History really began though in 1308 when the barons von Nesselrode—robber barons who preyed upon passing traders—built a castle to protect their nefarious interests. A 150 years later most of this castle was burned. A new castle was built, but during the Thirty Years War, Swedish, French, Spanish, Hessian, and royal troops attacked it. Today’s present castle dates from 1650. At the beginning of the 19th century, the von Fürstenbergs acquired the castle and enlarged it. After World War II, upkeep became an expensive proposition, and the family leased the property to hotelier Kurt Neumann, who turned Hugenpoet into a brilliant establishment. You have to laugh when you hear that the word Hugenpoet in German means “pool of toads.” Nothing could be further from that image! This top-class hotel excels in service, dining, and the only wildlife you might see swimming around in the moat are some carp. The atmosphere here is refined and elegant. This isn’t a kids-run-with-wild-abandon country-style hotel. Kettwig is 15 km south of Essen. You’ll need a car or taxi to reach the hotel and explicit directions, or the hotel will pick you up if you call them. Nearest railway station is in Essen. A striking moated castle in northern German style, Schloss Hugenpoet belongs to the von Fürstenberg family. 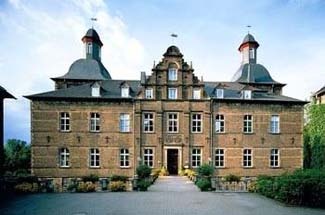 The schloss attracts businessmen from the nearby industrialized Ruhr Valley and various celebrities who come here to indulge in its highly rated cuisine. A handsome black marble staircase greets you in the entry hall and a splendid collection of antiques and fine art adorns the public rooms. Take time to examine the unusual Renaissance fireplaces, sculpted with Biblical and Greek themes. Many of the spacious guest rooms are accented by special antique pieces. A four-poster bed in one guest room is 400 years old. Some rooms are located in a newer wing, and although they are wonderfully comfortable, try for a room inside the castle. Spacious marble bathrooms are filled with L’Occitane toiletries.